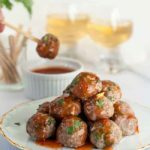 These spicy baked Thai Turkey Cocktail Meatballs are quick to mix, baked in the oven and served with Sweet Thai Chili Sauce for dipping. 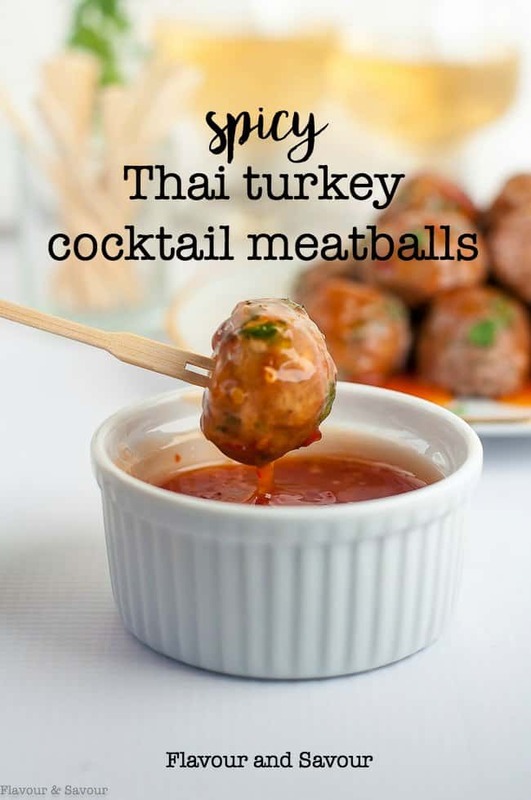 Spicy Thai Turkey Cocktail Meatballs are on the menu today, just in time for holiday parties! 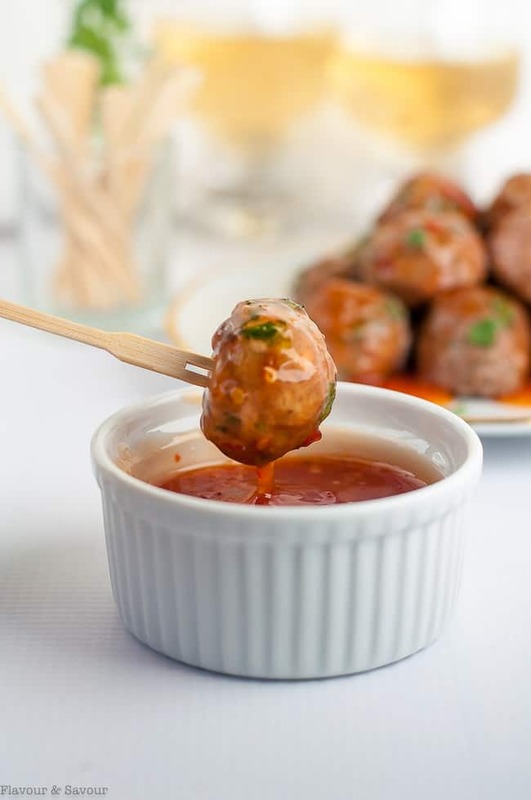 If you like a hot ‘n spicy meatball, dripping with a peppery sweet chili sauce, then you’re going to love these. 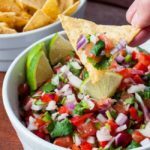 Not only are they tasty little morsels, they’re quick and easy to mix up, even easier to cook, and they need minimal clean up! That’s my kind of recipe. Scrumptious food, effortlessly prepared! 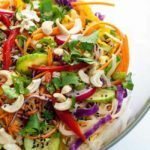 This recipe is a riff on Open Face Thai Chicken Burgers that we eat often. I used the same seasoning, but substituted ground turkey, formed them into cocktail-sized meatballs and baked them instead of frying. The best way to cook these turkey cocktail meatballs is to bake them in the oven. And the best way I’ve found is to arrange them on a rack on top of a baking sheet. In this way, heat can circulate underneath the meatballs, allowing for even cooking–and no sticking to the pan! Line the baking pan with a sheet of parchment paper for easy clean up. While you could make your own Sweet Thai Chili Sauce, and that’s very admirable, you can also go easy on yourself and use store-bought dipping sauce, like I did. Or, as an alternative, serve these baked turkey meatballs with the peanut sauce used in this recipe for Super Crunchy Thai Noodle Salad. 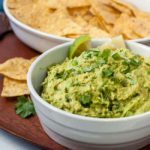 Mix the seasoning ingredients in a food processor, add the turkey and form into balls, bake and serve with party forks or cocktail picks and Thai sweet chili dipping sauce and enjoy! 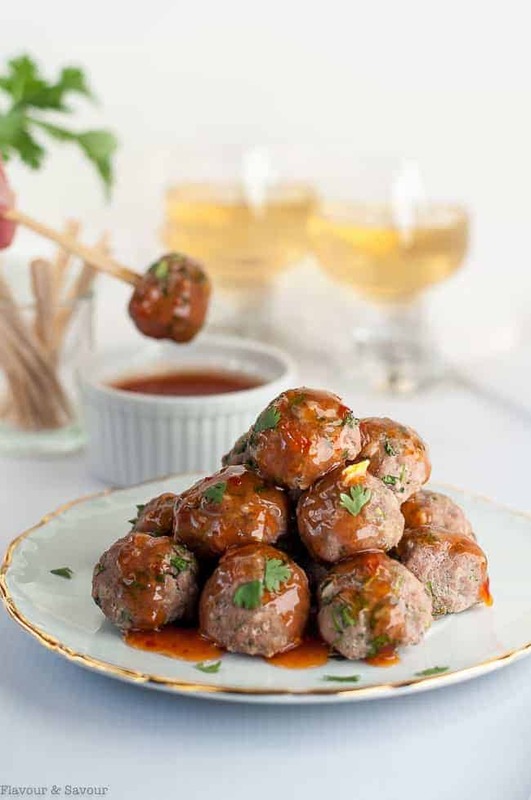 These spicy Thai Turkey Cocktail Meatballs are quick to mix, baked in the oven and served with store-bought Sweet Thai Chili Sauce for dipping. Preheat oven to 400°F. Line a baking sheet with parchment paper and place a cooling rack on top of the parchment paper. Brush or spray the rack with cooking oil. Put all ingredients except turkey in a food processor and process until finely chopped. Alternatively, chop or mince by hand. In a medium bowl, combine turkey with chopped ingredients, stirring until well incorporated. Using a cookie scoop or a spoon, form into balls about 1 inch in diameter. Place about 2 inches apart on rack. Bake for 15 to 20 minutes or until no longer pink inside. Transfer baking pan to the upper shelf in your oven and broil for 2 - 3 minutes or until tops of meatballs are beginning to brown. Remove from oven, transfer to a serving dish and serve with Sweet Thai Chili Sauce for dipping. 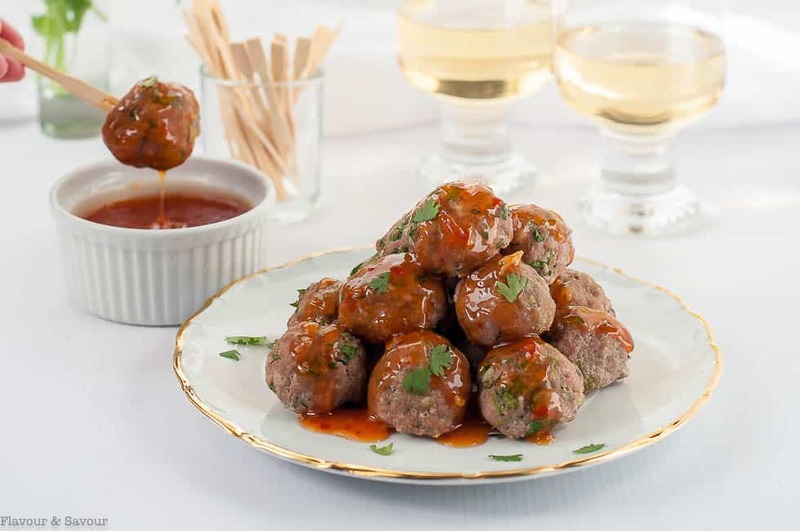 These cocktail meatballs can be baked ahead of time, stored in a tightly covered container in the refrigerator and reheated just before serving. I saw this recipe and made them right away! They were a big hit. Thank you. 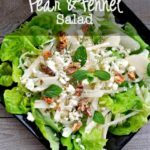 I’ll be keeping this recipe for other parties, too!